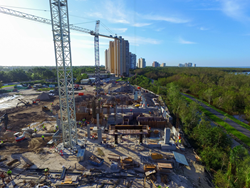 Pelican 1 Owner, LLC, the developer for Mystique, announces that all underground foundation construction has been completed for the 20-story Mystique tower. Pelican 1 Owner, LLC, is an equal partnership between an affiliate of the global investment firm Kohlberg Kravis Roberts & Co. L.P. (KKR) and an affiliate of the Gulf Bay® Group of Companies (Gulf Bay). Piling and construction activities commenced at Mystique in late June with the drilling of the 1,136 auger-cast piles that will support the iconic tower – each measuring about 14 inches in diameter and 70 feet in length. Following the pile cap installation and excavation, 42 pile caps containing over 90 tons of steel reinforcement were formed and poured, bundling the piles together. Over 2,200 cubic yards of concrete were used in the pile caps and grade beams – enough to cover more than three-and-a-half football fields with a four-inch thick concrete slab. Upcoming milestones include the pouring of the first elevated deck for Mystique’s Jardin residences in late October, followed by the pouring of the first floor of estate residences in late November. Mystique’s Certificate of Occupancy is estimated to be achieved in March 2019. Premier Sotheby’s International Realty, the exclusive listing agent for Mystique, is based out of the sleek and contemporary on-site sales center.